I'm going to let you in on a little secret. Nobody will believe that your Mondaine Stop2go watch is a quartz watch, because it has a complication that could only be accomplished through a mechanical movement...or so it seems. If complications are the cat's pajamas of watches, then the Mondaine Stop2go is a pair of fleece, woolen, cotton, and silk pajamas all wrapped up in one. Mondaine is the watchmaker that turned the iconic Swiss Federal Railway clocks into fun, energized watches. 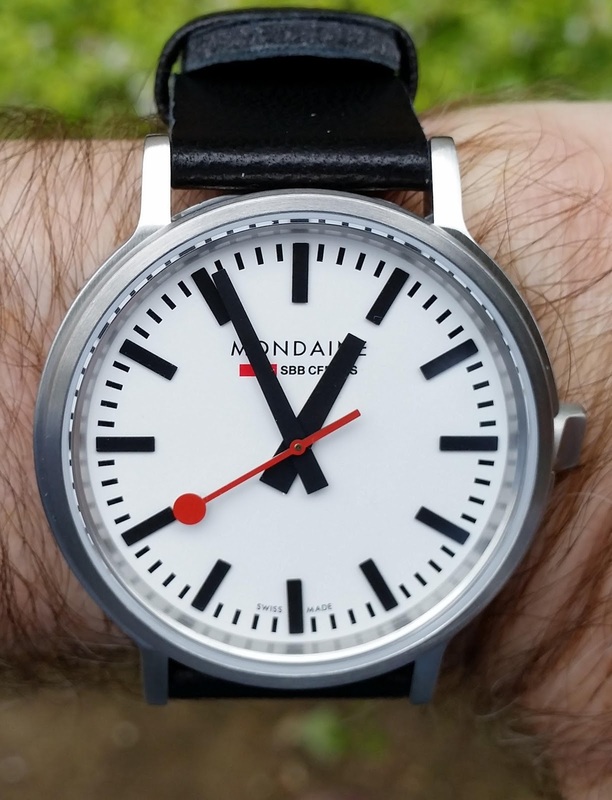 Mondaine’s red second hand, with its ball at the top, was designed to look like the handheld signal that let train drivers know they could leave the station. Mondaine’s watches are among the most recognizable in the world. They get noticed not because they look like art, but because they are art. The Mondaine Stop2go’s complication is, I think, one most inventive watch complications ever created. Moon phases, chronometers, GMTs, jumping second hands, minute repeaters, power reserves — they’re a dime a dozen. But the Mondaine Stop2go has a complication that stands all alone in the watch world, because it’s the only one that does this special thing. Watching the second hand pause for two seconds gives you a sensation of time stopping. For those two seconds you feel as if time has somehow been broken, but you know that it will resume before you take another breath. Swiss Railway clocks’ second hands move smoothly. Mondaine captured this same fluid motion on the Stop2go by having the second hand move forward four paces every second, which gives the illusion of a gliding second hand. A gliding second hand magnifies even more the sensation that time stops because of this watch. To enable the second hand to come a full stop while the minute hand jumps forward, Mondaine couldn’t use any ordinary quartz movement: Instead, it had to develop a movement with two independent motors, one for the minute and hour hands and one for the second hand. 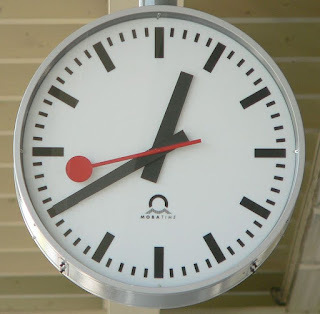 Swiss Federal Railway Clocks work the same way as Mondaine’s Stop2go watch: The second hand pauses at the 12 o’clock position for two seconds while the minute hand jumps forward. Letting the minute hand advance while the second hand remains motionless enables the railways’ clocks to be synchronized around the country and Switzerland’s trains to run on time. The watch doesn’t use a traditional crown. Instead, where the crown would ordinarily live, there’s a switch. If you pull the switch out, the watch stops and the second hand returns to the 12 o’clock position. Twist the switch forward to move the minute and hour hands forward or twist the switch backwards to reverse time. The Stop2go costs $455. It’s 41 mm in diameter but doesn’t feel big, even on a wrist as small as 16 cm, due to the watch’s minimalist look, short lugs, and well-thought out diameter-to-thickness ratio: it is 10 mm thick. The watch face is protected by a flat, anti-reflective sapphire crystal. It offers reasonable water resistance to 30 meters. If there ever was a competition for the fastest watch to read, the Stop2go’s black minute and hour hands and red second hand moving above the paper-white watch face would make this watch a winner. I think that most non-watch collectors silently yawn when we show them our GMT and even moon phase complications, in part because those complications move v e r y v e r y s l o w l y. But everyone who’s see my Mondaine Stop2go skip forward to the next minute thinks that it’s cool. Because it is cool. When you wear Mondaine’s Stop2go, you want to look at your wrist every 58 seconds to see the second hand pause and the minute hand snap forward. It’s so much fun to watch this watch that you’ll soon develop an unconscious ability to count 58 seconds in your head.